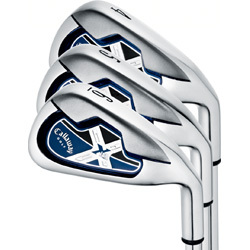 With a relatively thin top line and slight offset, the Callaway X-18R irons would seem to be suited to nearly any golfer. However, Callaway has put so many other game improvement features into this set, they end up being better suited to an intermediate or even high-handicap golfer. In addition to the design features you see when first picking these up, this iron set has extreme perimeter weighting to lower the Center of Gravity (CG) which helps the ball fly higher, and also uses the Callaway "Extreme Notch Weighting" to enhance forgiveness on off-center hits. The net effect of all this design technology is a club that has very little to offer in the way of feel, and even less in terms of workability. However, if your game needs help in the area of ball height, and you find yourself missing the center of the club face more often than you hit it, then the Callaway X-18R is definitely a set to consider. Callaway generally makes an attractive golf club, and these are no exception. A bright chrome finish covers most of the head, while there is a satin (non-glare) finish in the grooved area of the face. With a standard depth hosel and small black ferrule as are found on many Callaway clubs, the look is finished on the back with a royal blue and black insert and prominently shows the Callaway "X" in the cavity back. The X-18R is an eight-club set (4-PW, SW) and is available in right hand only with a Uniflex steel shaft and standard rubber compound grip.